We are manufacturing and supplying a broad range of Liquid Packaging Pouches. 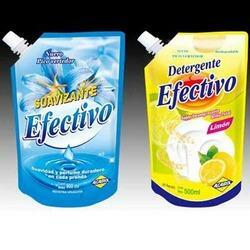 These liquid packaging pouches are manufactured from qualitative range of raw materials. These liquid packaging pouches are offered in variety of designs, shapes, sizes and colours. Our orders are delivered in accordance to the specification given by the client. Our quality analyst conduct test on our range of packaging. Looking for Liquid Packaging Pouches ?